BUEHLER WINS SIEGELMAN: Randy Buehler of Bellevue, WA made his first year as a BPA member a memorable one. After attending his first WBC this summer, Randy made a return trip cross country to attend Euro Quest VIII where he made off with the top prize by winning the Harald L. Siegelman Award by virtue of four second place finishes, besting 2007 HLS winner Rob Kircher by four points. Two other newcomers, Mike Turian of Maple Valley, WA and Edward Fear of Rochester, NY finished third and fifth respectively. Veteran Henry Dove of Easton, MD finished fourth. In addition to the aforementioned players, tournament winners included Doug Galullo, Barb Flaxington, Jeremy Oppenheim, Andrew Yao, Rebecca Hebner, Eric Monte and Sceadeau D'Tela. Euro Quest set a new attendance record in its larger facility at the Pikesville, MD, Hilton buoyed by demonstrations of the hot new Essen games by Alliance Distributors. Congratulations to CD John Weber and his GCOM crew for a very successful event. More details can be found at http://www.boardgamers.org/specific/eq10.htm including links to a complete photo collection by Eric Haas. 2010 AFTER ACTION REPORTS: The latest WBC Event After Action Report pages complete with the latest Laurel counts and photos as only WBC does them are now available at http://www.boardgamers.org/yearbook/ We suggest you peruse them to recall last summer's fun or see what you missed before deciding what events to support with your votes when renewing your 2011 membership. 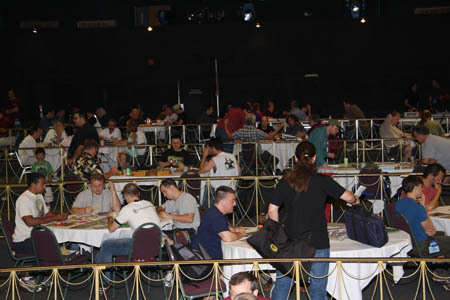 Find out what events made the Century list and review the lineup of Trial Events eligible for the 2011 WBC at http://www.boardgamers.org/wbc/orphans.htm. DECEMBER MEMBERSHIP DRIVE UNDERWAY: Renew your Sustaining or Tribune membership for 2011 by Dec 31 and get a free WBC souvenir T-Shirt or embroidered hat and full-color 2010-2011 yearbook. We urge you to renew memberships	for 2011 NOW through the end of the year both to save money with our	lowest rates and to vote your choice of the 25 Continuing Trial events	and the winner of our annual Sportsmanship Award. Vote to retain your	favorite events or introduce new ones. Your vote must be received (or postmarked) by	Dec. 31 to count and be accompanied by payment of 2011 membership dues. You may pay for your membership with credit or debit card online using PayPal. You can use PayPal whether or not you have a PayPal account. Simply click on the "Pay Via PayPal" button after	submitting your membership application online. If you have any questions, contact Kaarin Engelmann at acd@boardgamers.org. To make payments with a check by post use the appropriate link to	print your application. 2011 MEMBERSHIP POLICY CHANGES: There are minor changes forthcoming in	2011 BPA membership and WBC admission policies. Early commitment to a Sustaining Membership covers all WBC events from	Monday thru Sunday for $70 with no annoying event fees to pay. All	members joining by the Dec. 31 deadline living in the U. S. will	receive both a free full-color Yearbook mailed in May (those outside	US will receive theirs on arrival at WBC) and their choice of a WBC Souvenir T-Shirt or embroidered cap upon arrival provided they have	indicated their choice on the membership form. Those joining after the	New Year will be able to purchase these items separately until	4/30/2011. The popular BPA embroidered duffle bags offered last year will only be available in 2010 for those ordering them by April 30, 2011, for	delivery at WBC at a cost of $40 each. Given the long lead time	required for orders, we will be unable to offer them after that date. Sustaining memberships purchased after Feb. 28 will increase to $80. The December membership application is posted with the 2010	Ballot for Trial events and Sportsmanship nominees. Check the full details on our membership terms page. SPORTSMAN NOMINEES: The WBC list of 2010 Sportsmanship nominees is now	on line. Before renewing your BPA membership, please check out all the worthy candidates there and select one to support on your ballot. Let's reward good sportsmanship with free lodging at the 2011 WBC. WBC 2011 FORMAT CHANGES: We will again feature a full week of gaming	running from Monday morning through Sunday evening with assorted pre-cons during the previous weekend. The Sampler Showcase and WBC	Auction and Auction Store will again begin the week before the main	tournaments commence in earnest on Tuesday evening. Open Gaming in the	popular Showroom setting will commence two days earlier on Monday with	expanded use of the BPA Gaming library. A small number of events will	continue to be run on Monday to augment the Sampler Showcase, but the	bulk of Tuesday will remain dedicated to the Auction and Auction Store	without tournament scheduling conflicts. The Auction will move to	Lampeter Hall to increase access to Open Gaming and the Library. WAM IX: The lineup for the ninth pre-Super Bowl weekend Winter	Activation Meeting is complete with the selection of the four	tournaments to be offered in 2011. The new Washington's War headlines	a quartet of CDWs including Hannibal, Combat Commander and Twilight	Struggle. The convention will	be held Jan. 27-30 in the Timonium, MD Holiday Inn. GM RESERVATIONS: All WBC 2010 GMs are reminded that "reservations" for the events they ran in 2010 expire on Jan. 1. To retain GM status of your event, you must submit a new Event Form and renew your membership by the end of the year. Otherwise, those events will be listed as OPEN on the Orphan's List in an attempt to attract a GM. If you know you will not be running the event in 2011, contact the convention director as soon as possible to remove your reservation. BoD NOMINATIONS: All BPA members are hereby notified of their right to	nominate members for the three Board seats whose terms expire at the	next WBC. To appear on the ballot, a member must be nominated in	writing by at least three members; one of which must be himself/herself. Nominations must be signed and received at BPA, 1541 Redfield	Rd, Bel Air, MD 21015 no later than Feb. 28 to be eligible for	election in that year. NOTE: Email nominations are NOT acceptable, nor	can a member nominate more than one member for the Board. When	contemplating nominations, members are urged to consider that the BPA conducts most of its business by email and needs Board members who are	able and willing to offer their time and skills to the organization in	a timely manner. Board members should be considered more for their	ability to contribute to the running of a successful company than for	their attachment to any particular game or genre. Besides forwarding a	signed nomination, each nominee should submit by March 1 a statement	not to exceed 100 words summarizing what they can contribute in	service to the Board of Directors of the BPA. The nomination form is online. BOARD ACTIONS: In order to provide backup support to our Treasurer,	Ken Gutermuth, the BPA Board has appointed Pete Stein to serve as	Controller. EURO COORDINATION: Eric Freeman is again volunteering to co-ordinate	Euro events in an attempt to minimize scheduling conflicts. If you'd	like to be part of this effort, contact freemaneric@comcast.net. ADVANCED CIVILIZATION: The latest PBeM tournament to be undertaken is to begin in January at http://civ.rol-play.com. This website is a 100% free service, but registration is required. Play will consist of two concurrent first round games, with the top eight players advancing to a Final game. The tournament will require 48-hour player turn limits andshould be completed by August. For more information, please view the tournament website or	email the GM at kevinyouells@gmail.com before Jan. 12. MARCH MADNESS: Tom Browne is the first coach to advance a team (SetonHall 1989) to the Sweet 16 in this year's tournament and conference play hasn't even started yet in the real world. See http://www.nktelco.net/bdmonnin/mm-brack-2011.htm to check the progress of this year's brackets.